Rooi Els is a small village on the east coast of False Bay surrounded by some of the mountain peaks that make up the Hottentots Holland Mountain range. The village is built alongside the Rooi Els river and under a large overhanging rock formation that reaches hundreds of metres into the air. Being in a wilderness area there is a lot of wildlife to be seen. Other than some obnoxious baboons which raid the houses of the residents from time to time there are plenty of birds as well. Many of the unutilised plots in the area are covered with fynbos and I suspect many have snakes such as the cobra and puffadders living on them. 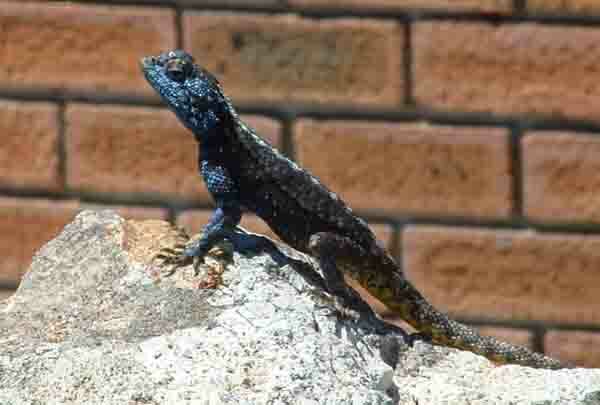 Other residents of Rooi Els are the bright blue and brown rock lizards which live among the rocks and can be seen sunning themselves in the midday sun. They look like statues and only move away when one gets too close. Rooi Els has grown up in the teeth of the south east gales that blow there in summer. Sometimes the wind is so strong that it knocks walls of newly constructed buildings over. 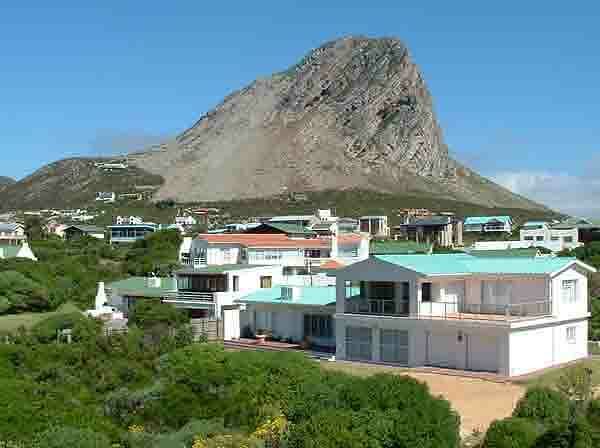 Many homeowners have chosen plots high up on the mountain slopes so as to have unadulterated views out over False Bay. The coastline in the immediate vicinity of Rooi Els is very rocky although there is a lovely bay with a safe beach for swimmers on the northern side where the Rooi Els river flows into the sea. Fishing is a popular pastime as there are many cliffs and rocky outcrops from where anglers can cast into deep water. In certain instances anglers have to climb down sheer cliffs to get to the fishing spots and if they are lucky drag their catch back up the hill to their vehicles. The eastern shoreline of False Bay is very dangerous as it is often hit by freak waves which well up from nowhere and can wash the unsuspecting angler off his perch. Over the years many anglers have lost their lives and their families have erected crosses on the mountain slopes near to the place where they lost their lives. That however does not scare off others as you will find many anglers fishing off the rocks when the conditions for fish look good. Rooi Els has the added benefit that it is built in beautiful surroundings. Clarence Drive from Gordon's Bay has some fantastic scenery as you will see when you drive along it. In some places the mountains drop straight down into the sea and in others there are gentle slopes covered by fynbos. 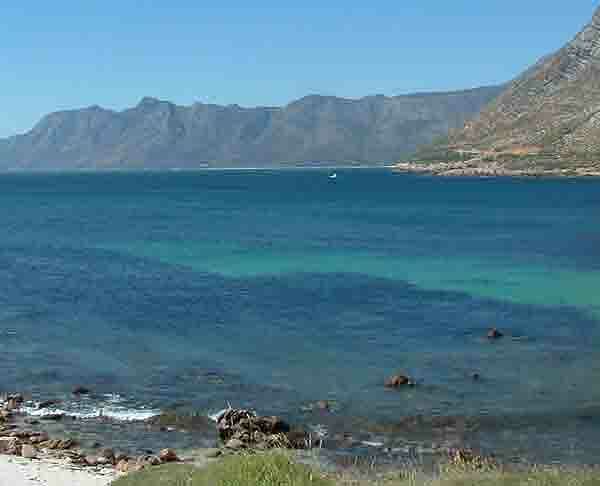 False Bay is normally a lovely shade of blue and the water around Rooi Els can be anything from green to blue. For those people who love a walk on the wild side but yet not too far from town Rooi Els is the place to visit. There are walks along the beachfront through sand dunes and the fynbos. Exploring some of the rocky outcrops that rise above the water of the many small inlets and even climbing the rock that hangs over the village are pastimes to enjoy when visiting Rooi Els. Next time you visit Cape Town stop off at Rooi Els before continuing your drive around the coastline to Hermanus.